I thought I would show a recent aquisition. This is a 9 1/2" size Hostetters is a nice dark green. It has paper thin glass and is as light as a feather. What is remarkable to me is it was dug at 20' in depth completely surrounded by bricks which had to have fallen 20' themselves. The un named digger found this example in a Northwestern state, in a town known for 20' and deeper privies. 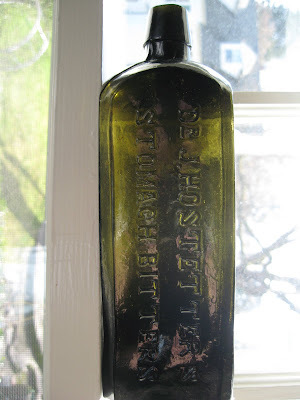 The bottle does not have so much as a scratch on it, and while there are zillions of Hostetters out there, this is a true survivor from the late 1850s or EARLY 1860s.